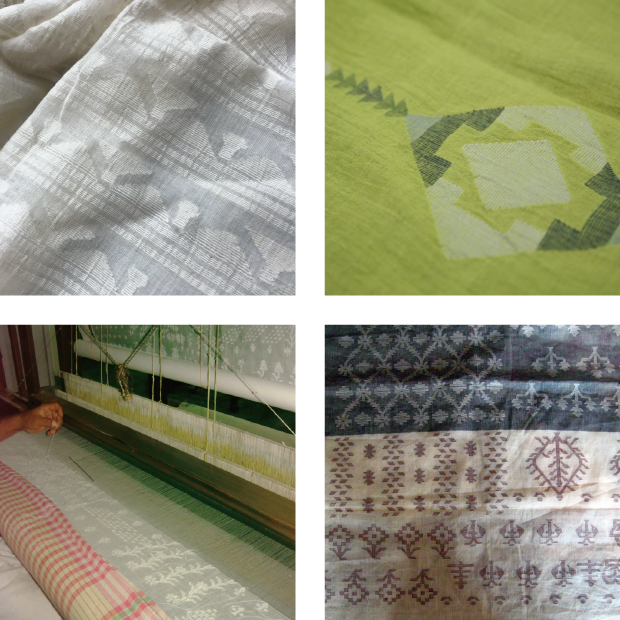 Jamdani is one of the finest muslin textiles of Bengal. 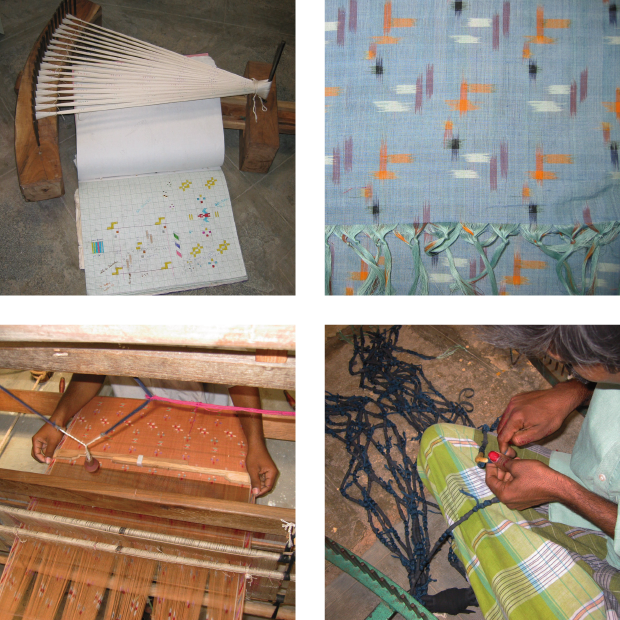 This is a supplementary weft technique of weaving, where the artistic motifs are produced by a non-structural weft, in addition to the standard weft that holds the warp threads together. The standard weft creates a fine, sheer fabric while the supplementary weft with thicker threads adds the intricate patterns to it. Each supplementary weft motif is added separately by hand by interlacing the weft threads into the warp with fine bamboo sticks using individual spools of thread. The result is a myriad of vibrant patterns that appear to float on a shimmering surface. 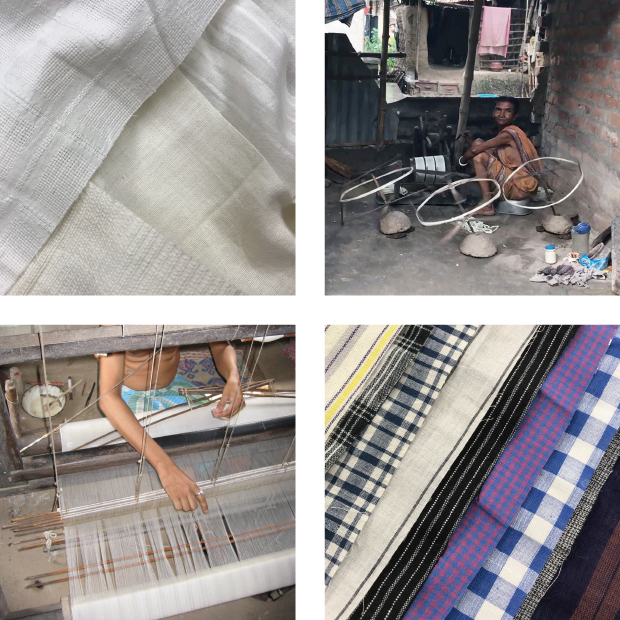 Khadi is handspun, hand-woven natural fiber cloth from India, Bangladesh and Pakistan mainly made out of cotton.The cloth is usually woven from cotton which is spun into yarn on a spinning wheel called a charkha and this primitive process can create uneven and unique hand feel on it’s surface. In ikat the resist is formed by binding individual yarns or bundles of yarns with a tight wrapping applied in the desired pattern (ikat means "to bind" in the Indonesian language). The yarns are then dyed. The bindings may then be altered to create a new pattern and the yarns dyed again with another colour. This process may be repeated multiple times to produce elaborate, multicolored patterns. When the dyeing is finished all the bindings are removed and the yarns are woven into cloth.